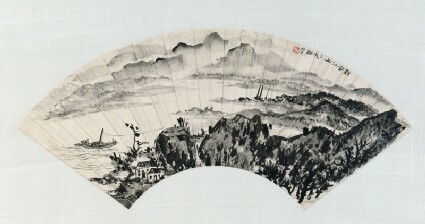 The depth of the landscape in Boats on the River Xin'an [EA1995.232.a] is conveyed in the constrained fan format by the distant hills across an expanse of water; in Going to Work [EA1995.232.b], the size of the fields is accentuated by the small proportions of the figures already labouring and the meandering of the file of figures and animals on their way to work, probably of the 1960s, when the filing workers occur on painted porcelain plaques and other propaganda objects of the period. Qian Shoutie, also known as Shuya, was from Wuxi, Jiangsu province although he became active in Shanghai. In his youth he was an apprentice in a stele-carving workshop. He was also interested in ancient calligraphy, and became well known for his seal carving. 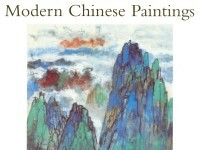 He was involved with numerous painting societies and after 1949 taught at the Shanghai Chinese Painting Academy. The red flag in Going to Work suggests this is a political work, probably of the 1960s.